Everything! The place was amazing, typical Greek and cozy, the pool was cute and ideal to refresh and the little balcony on the upper bedroom gave us the best view ever! Also, the team was really polite and smiley, trying to do their best for our comfort! The private pool is great for the price, and the flat is cosy. Akrotiri is a charming village and there are less tourists than in Fira or Oia for example, which is resting. The host is really friendly! We had enough space for four persons and a lovely view! This property was clean and well managed. The views were amazing although our unit was at the back of the development so we had only a partial sea view from our terrace. The beds were really comfortable and the property had airconditioning. The kitchen facilities were basic, perfect for making breakfast or a simple lunch but nothing more. There was a lovely family run Taverna up the road with good food and fresh seafood at very reasonable prices compared with other areas of the island. 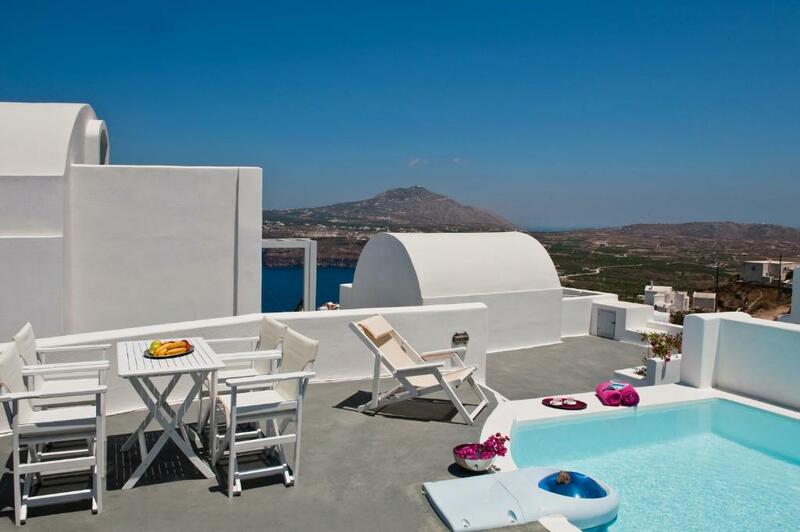 Staying here gives a totally different experience of Santorini from the hilltop villages. Much more laid back and much less overpriced! The beds were really comfortable, cleanliness, the whole apartment was really nice and i have no hesitation in recommending it. La vue depuis la terrasse est vraiment très belle. On n'a trouvé un hôte (Dimitri) très sympathique qui répondait à toutes nos demandes. La piscine sur la terrasse est vraiment un plus quand on voyage avec des enfants. Lock in a great price for Aura Marina – rated 8.7 by recent guests! 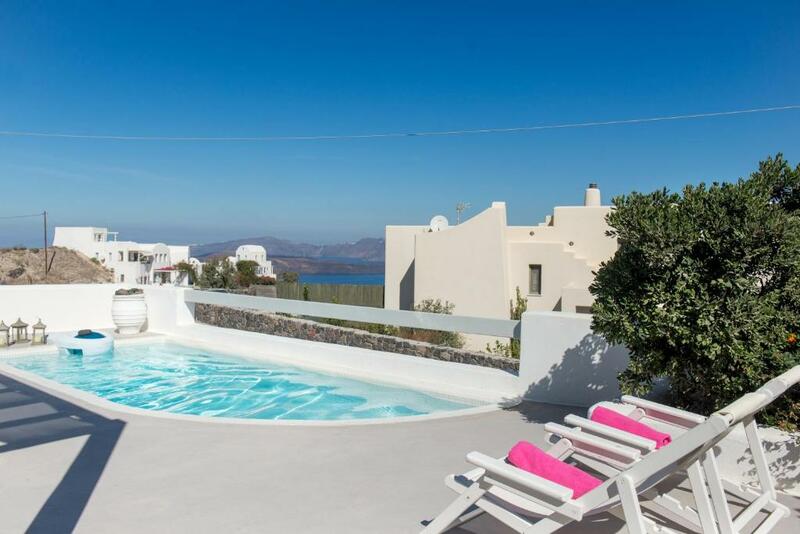 Aura Marina apartments is a complex of nine self-catering apartment-houses, built in the traditional architectural style of Santorini each with its own terrace and private pool. 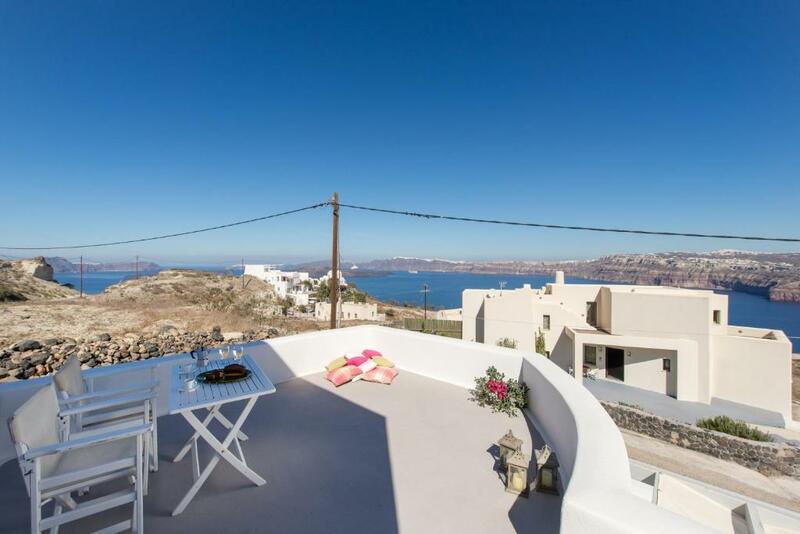 Located 2,650 feet from Akrotiri, it overlooks the caldera, the town of Fira, and the villages of Pyrgos, Imerovigli and Oia. All units are air conditioned and have a dining area and a seating area with a flat-screen TV. Some units include a terrace and/or balcony with sea views. All units feature a kitchenette fitted with a microwave and toaster. A refrigerator and kettle are also offered. 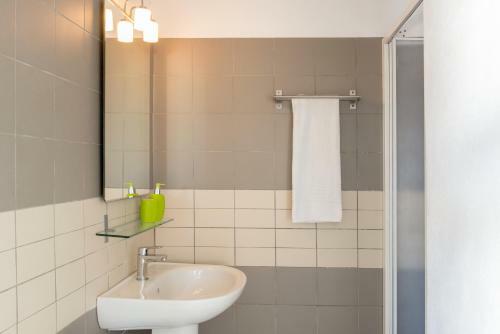 Each unit is equipped with a private bathroom with a bidet. The apartment features free WiFi. The beaches of Mesa Pigadia and the famous Red Beach is a 5-minute drive away, while the beaches of Perissa, Perivolos, Vlychada are a 10-minute drive away. Fira is at 7.5 mi, Imerovigli at 9.3 mi, and Oia at 16 mi. When would you like to stay at Aura Marina? This apartment has a seating area, patio and private entrance. This apartment features a private entrance, sofa and patio. This split level apartment features a plunge pool and magnificent Caldera views. The living area is fitted with a sofa bed and TV. There is a well-equipped kitchenette and outdoor dining area. 2 bathrooms stocked with a shower are also available. 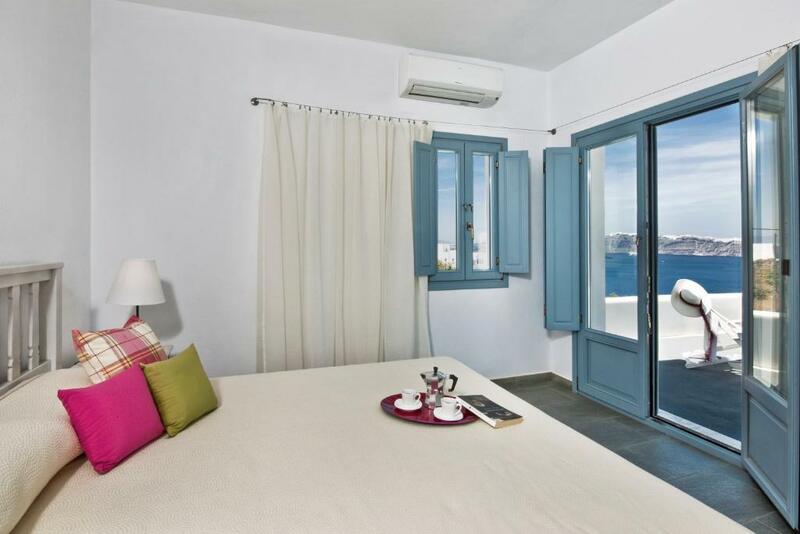 Aura Marina apartments is a complex of self-catering apartment-houses, built in the distinct traditional architectural style of Santorini. 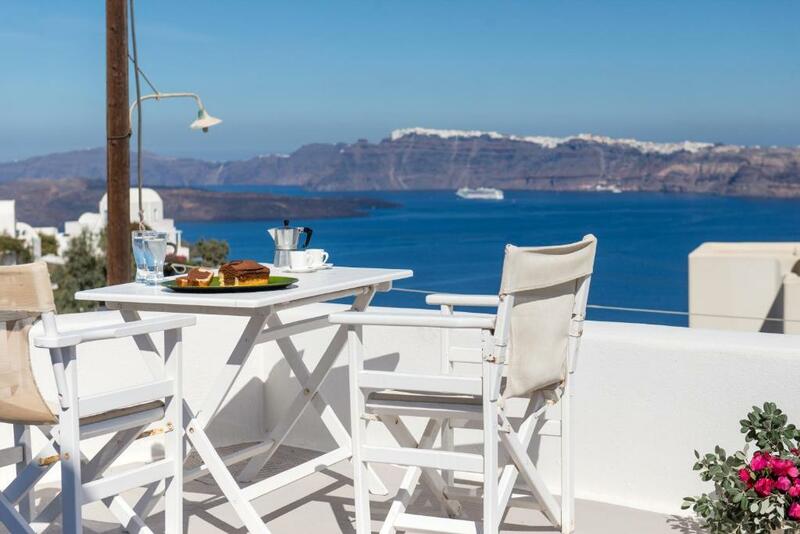 We are situated near the village of Akrotiri, on the south west-side of the island, overlooking the volcanic caldera and with views to the town of Fira, and the villages of Pyrgos, Imerovigli and Oia. Our concept is to offer a home away from home with its own plunge pool and terrace or balcony with views, without the expense of services. Our location is in a quiet, semi rural area, with a couple of restaurants with good food and views to the caldera within walking distance, few grocery stores and few restaurants, in the centre of the village of Akrotiri in a distance of 800 meters. The nearest beach, Kabia is 2 km away. The beaches of Mesa Pigadia and the famous Red Beach is a 5 minute ride from us while to get to the beaches of Perissa, Perivolos, Vlychada the car ride lasts maximum 10 minutes. From here to the capital, Fira, the distance is 12km ( a 15 min ride), 15km to Imerovigli, 25km to Oia ( a 35 min ride), and 28km to Kamari (a 25 min ride). Our area is a semi rural one near the village of Akrotiri, with a few of taverns with home cooking and views to the caldera, the picturesque lighthouse, the archaeological site of Bronze Age Akrotiri settlement, the famous Red Beach. House Rules Aura Marina takes special requests – add in the next step! Cash Aura Marina accepts these cards and reserves the right to temporarily hold an amount prior to arrival. Aura Marina accepts these cards and reserves the right to temporarily hold an amount prior to arrival. Please note that cleaning service is not provided during the stay. Please inform Aura Marina of your expected arrival time in advance. You can use the Special Requests box when booking, or contact the property directly using the contact details in your confirmation. Location in the very south of Santorini, which implies more time to reach Fira or Oia. Also, the point of view depends on the appartement you will get. Magnificant view and splendid location ! Each unit had a pool but unfortunately it was too small to actually swim in. However great for cooling off and for kids. The larger units at the front enjoyed the better view. There was only 1 shop within walking distance and this was really not up to much. We were there to relax for a few days but if you stay longer you would definitely need to hire a car. If I have to mention something I would say that I would like to have more privacy by our private pool. There is no place that you can access by foot. You need a car in order to get to the restaurants. The girl in the reception was properly rude any time we requested something. We had no cooker in the kitchen and we had to insist to get a functioning cooker as all the meat we bought was about to get expired. The fridge was very small, only fitting some bottles of water, which for a week and 5 people was imposible. We were promissed views and pool but the pool we had was not big enogh to fit 5 people in it!!! As an overall it was a big dissapointment for the money we payed. You definitely need a car. Was chilly at night.